It was the best, and safest, advice Sgt. Glen Harris could offer Officer J.A. Gilbert. 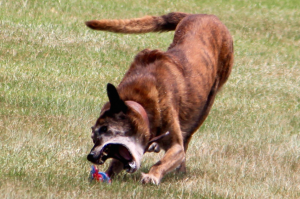 That’s because any move — deemed the wrong move by Breston — would have the 12-year-old Dutch Shepherd’s moving to sink his teeth into Gilbert’s padded arm. It was a risk Gilbert didn’t want to take — at least not unknowingly. Sgt. Glen Harris and Breston put on a show of obedience and discipline for Junior Police Academy cadets. Harris and Gilbert — with no small amount of help from Breston — led the K-9 demonstration on Thursday at Ed Tull Park. 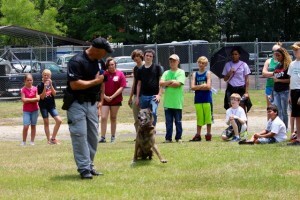 It was the highlight of the fourth in the five-day Junior Police Academy, an annual summer program hosted by the Rockingham Police Department for youth ages 11 to 17. 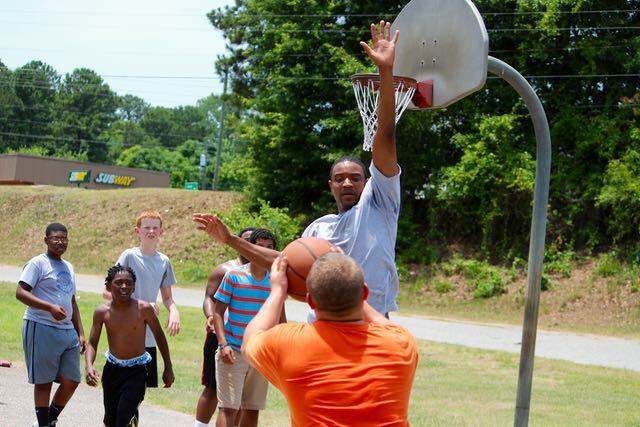 The camp wraps up with a trip to the firing range and a Police Officers Physical Abilities Test Friday morning, then a swimming party and cookout from 1 p.m. to 3 p.m. at Browder Park. Each day, the campers have lunched at various establishments, including Hardee’s, Domino’s, McDonald’s and Mi Casitas. Earlier this week, cadets have toured a variety of public safety agencies and offices, including the Rockingham police and fire departments, the Richmond County Emergency Communications Center, Senior Resident Superior Court Judge Tanya Wallace’s office and more. In addition, they have learned about evidence collection and witness processing through academic work and practicals at Hinson Lake. Rockingham Police Department Officer J.A. 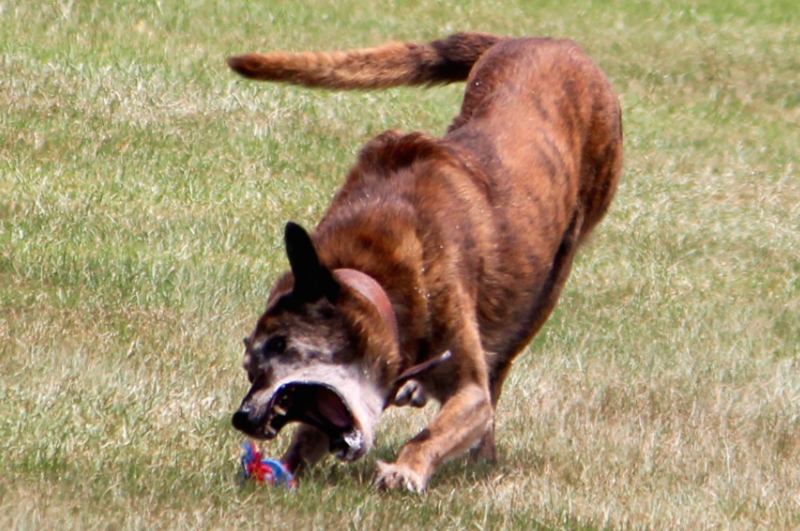 Gilbert goes toe to teeth with Breston, a 12-year-old Dutch Shepherd and a veteran police officer in his own right. The camp wraps up Friday with a Police Officer Physical Abilities Test challenge on Friday after a visit to the firing range, then a swim and cookout from 1 p.m. to 3 p.m. at Browder Park. Under the hot, unrelenting sun on Thursday at Ed Tull Park, though, in an environment that offered anything but an air-conditioned office, cadets participated in a number of scheduled and unscheduled activities that included bragging-rights-only wind sprints. While waiting for the lunch hour to officially end, several young athletes picked up a basketball and challenged officers to a game. They held their own — mostly — in a fun but competitive stretch. 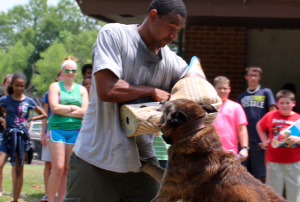 During class time, Breston — who has earned the highest certification possible from the International Police Work Dog Association — took advantage of the limelight to apprehend the “suspect,” a role played with a smile by Gilbert, and to mark two vehicles for suspected marijuana. While Gilbert wrapped his left arm in protective padding, Harris showed how well-trained Breston was. Breston had already identified Gilbert as the “suspect,” or “aggressor.” Harris repeatedly warned Gilbert not to make any sudden moves. Then he said to do so. In an instant, Breston was on Gilbert. Breston also didn’t take too well Gilbert’s choreographed shove on his partner and again had Gilbert under his control. As interesting and as much fun as the scheduled activities went, the academy offers young people like 16-year-old Hunter Wilkes the chance to sound off on questions about the law. Wilkes asked Harris a series of specific questions about ATV use on roadways — and wondered why police officers made such a fuss over it. 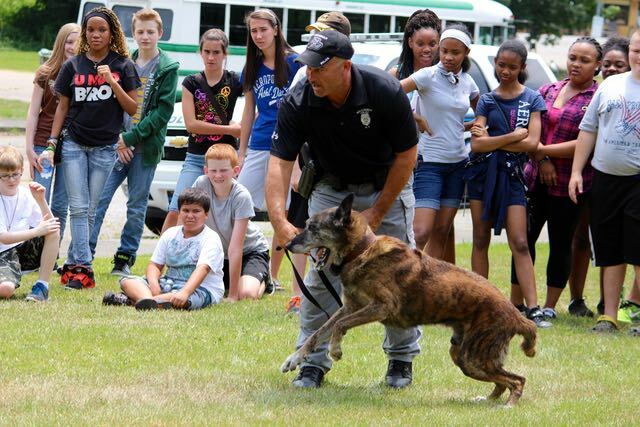 Breston bared his teeth to the delight of the keeping-a-safe-distance class of Junior Police Academy cadets on Thursday at Ed Tull Park in Rockingham. Harris has been in law enforcement for 14 years and he has yet to pass a law. Instead, Harris noted, his role in the system is to enforce the laws on the books. He explained to Wilkes in what circumstances officers choose to pursue ATV riders — often choosing not to for fear of creating a situation even more unsafe than what the ATV rider already has presented. Instead, Harris said, police usually wait until the next time they patrol that area to catch them. Wilkes, for his part, understood Harris’ position but made clear his disagreement with it. He suggested he might run for public office some day in hopes of changing the law.